Two stroke engines are developed to obtain higher power output from a given engine size. This type of engines is mainly used in scooters and mechanical pumping devices where high power is required. Two stroke engine is available for both diesel and petrol fuel. In the two stroke engine inlet and outlet valves are replaced by inlet and outlet ports or holes which are situated at cylinder wall. They are controlled (open and close) by piston motion. 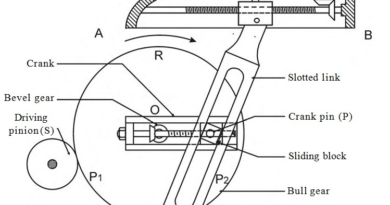 There is also a third port known as transfer port, which is situated inside the cylinder and connect the crank case to the cylinder. 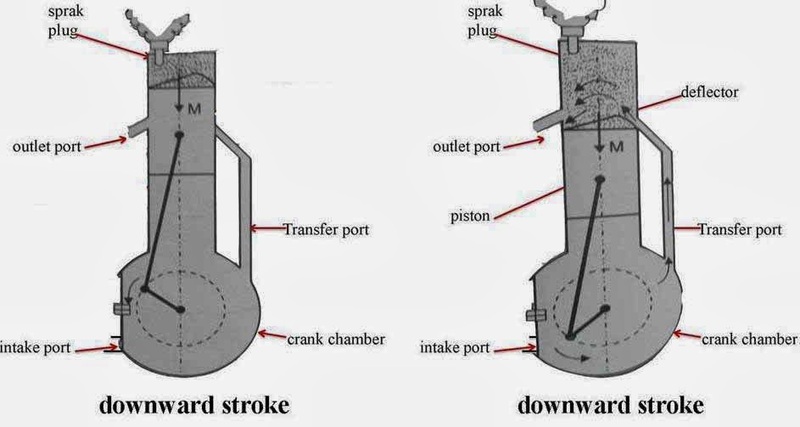 In the two stroke engine, all four processes suction, compression, power and expansion are performed during two engine stroke or in one time engine moves up and down. 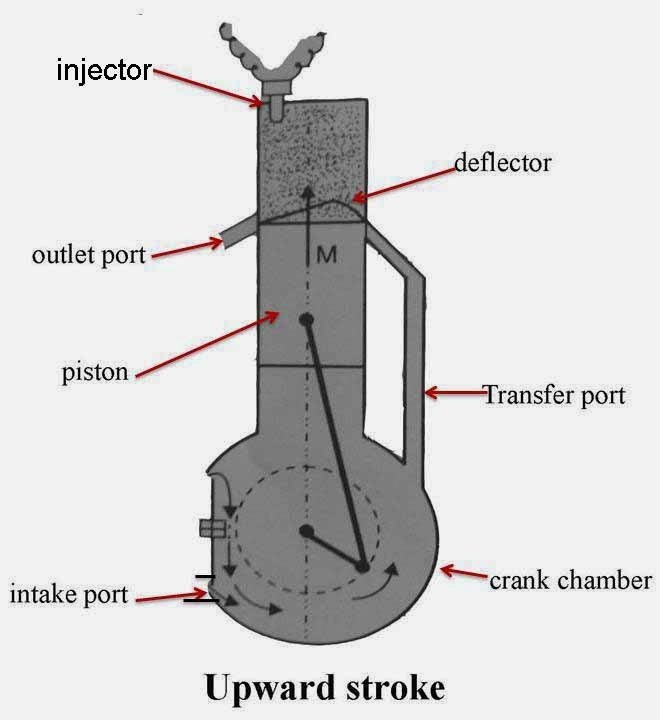 In the upward stroke piston moves form bottom dead center to top dead center and compressed the air fuel mixture which is drawn into cylinder during downward stroke. When the piston moves upward, the inlet port open and fresh charge of air fuel mixture enters into crank chamber. When the piston is near top dead center, spark plug generates a spark and ignites the compressed air fuel mixture. At the end of upward stroke, spark plug ignites the air fuel mixture, which generates a high temperature and pressure inside the cylinder. This high pressure force exerts a thrust on piston. So the piston starts moving form top dead center to bottom dead center. When the piston moves downward, it compressed the air fuel mixture in the crank chamber. Near the end of this stroke exhaust port opens so the exhaust gases starts to moving outside form cylinder. At the same time transfer port also opens so the compressed charged starts flow from crank case to cylinder. There is a deflector situated inside the cylinder which immediately deflect upward and not to allow mixing of air fuel mixture with exhaust gases. It may be noted that air fuel mixture helps to removal of exhaust gases from the engine cylinder. The piston again starts moving upward and compressed the charge. This processes run until the engine run. In the upward stroke piston moves form bottom dead center to top dead center and compressed the air which is drawn into cylinder during downward stroke and generate a high temperature into cylinder. When the piston moves upward, the inlet port open and fresh air from atmosphere enters into crank chamber. When the piston is near top dead center, fuel injector, injects the fuel into cylinder chamber in spray form. At the end of upward stroke fuel is injected into the cylinder. The compressed air temperature is enough high to ignite the fuel so combustion of fuel take place which generates a high temperature and pressure inside the cylinder. This high pressure force exerts a thrust on piston. So the piston starts moving form top dead center to bottom dead center. 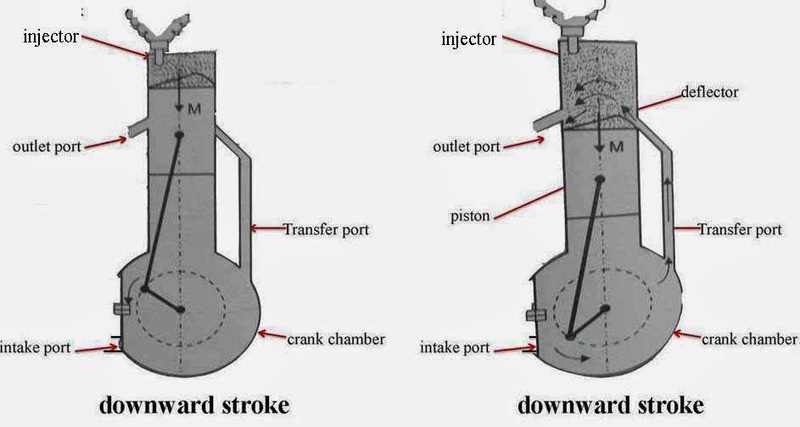 When the piston moves downward, it compressed the air in the crank chamber. At the end of this stroke exhaust port opens so the exhaust gases starts to moving outside form cylinder. At the same time transfer port also opens so the compressed air starts to flow from crank case to cylinder. There is a deflector situated inside the cylinder, which immediately deflect upward and not to allow mixing of air with exhaust gases. It may be noted that air helps to removal of exhaust gases from the engine cylinder. The piston again starts moving upward and compressed the air. This processes run until the engine run. Today we have learnt about two stroke engine. If you have any query regarding this article, ask by commenting. If you like this article, don’t forget to share it on social networks. Subscribe our website for more informative articles. Thanks for reading it. ← How Does a Four Stroke Diesel and Petrol Engine Work?